A six pointed starred crop circle appeared on July 18, 2017 in a barley field on Cley Hill, west of Warminster in Wiltshire, England. To some, this crop circle may look like it’s just another intricately designed crop circle similar to many that appear in England’s crop fields. However, for some of us, life changes, synchronicities, and experiences made us take a second look at this crop circle’s meaning. The massive Cley Hill crop circle has been nicknamed “Metatron’s Cube” because of its base similarity and recognizable six pointed star fractal patterns. It has many meanings and interpretations according to each person’s connection to it. In this article I will share my experience with this special crop circle as well as messages that were given to me and other people’s comments about it. Here is a Facebook Live recording that Gregg Prescott did from June 25, 2017 where he mentioned the Prism of Light Sarasota. Keep in mind we did not know who the people were who worked on this project. I have cued it up to where Gregg begins talking about it. Click here to Follow Gregg Prescott and to join in on future In5D Facebook Live chats! The Cley Hill crop circle appeared the day after I had a huge download and activation while attending the 10th anniversary of the “Grounding Light Meditation” on June 17, 2017 with Rev. Sharon-Elizabeth James of The Cosmic Center Of Spiritual Light in my home city of Sarasota, FL. My life has been moving at “light speed” ever since. It seems like I had previously been in a “time warp” or stagnant series of “groundhog days” or repeating timelines for a while now. I took this crop circle as a “pay attention” message which I will go into more after this background introduction. 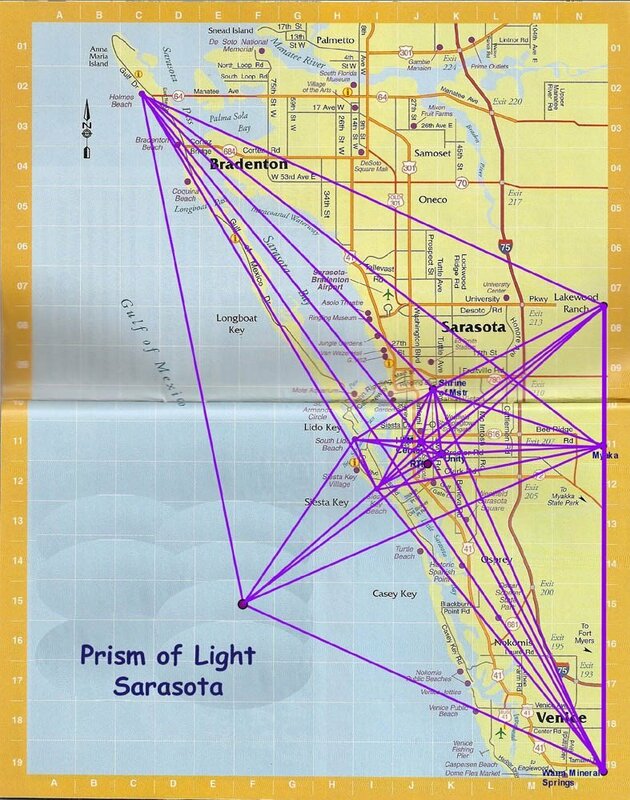 Before the meditation that night, Sharon-Elizabeth shared some of the history behind the “Prism of Light” group effort to create “node” points for a grid that was anchored around the Sarasota and surrounding areas on June 20, 2008. The anchor boundaries were from the north in Bradenton to the South in Venice and from the east to Lakewood Ranch and from the west to a Stargate in the Gulf of Mexico. 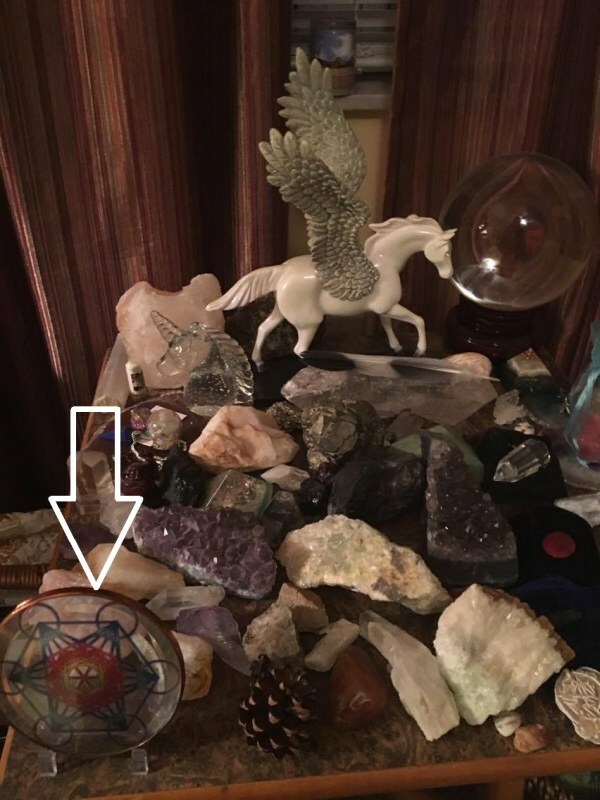 Please read more about how this Prism was grounded in the article Sarasota, A Crystal City of Light. According to the article, on June 30, 2008 there was a confirmation crop circle that was in the same formation of the Prism of Light Sarasota that appeared in the wheat fields of Wiltshire, U.K. The exciting thing that triggered me about Sharon-Elizabeth’s presentation is that I have been thinking of working with The Cosmic Center of Light for a few years now and anchoring the light was the goal then. I met with Sharon-Elizabeth and discussed this a while back, and we were in agreement of the importance of this task. I also was happy to see others, like Cobra, urging a weekly meditation on Sundays as well (read more here). Sharon-Elizabeth was going to make her 10 year anniversary of the anchoring light meditation small and private, but spirit told her she needed to make it open to the public. Before going to this presentation, Gregg and I had no idea that Sharon-Elizabeth’s group of friends were responsible for the Prism of Light work! I sat there in bliss for about an hour, listening to the summary of the work done on the Prism of Light and anchoring the light meditations EVERY MONDAY FOR 10 YEARS. After realizing the profound synchronicities involved I just KNEW that this Prism of Light Sarasota would be the groundwork for Sharon-Elizabeth and In5d to work together in service. I also downloaded that NOW it was the time to work with the community to finish manifesting the City Of Light in Sarasota, which is the next level beyond the Prism of Light. Furthermore, it is time for all cities of light around the planet to be lit up. What does this have to do with the Cley Hill crop circle? As I have mentioned, there are many messages in the Cley Hill crop circle. The main message that resonated with me the most was COOPERATION. For me, it represents the lightning fast support the Universe is giving to starseeds and lightworkers with projects that are on the highest and best timeline for personal ascension as well as combined planetary ascension. The Sarasota City of Light is one of those projects that I will be sharing more information on soon, including how you can be a co creator in Sarasota or where you live. So one of the major things that happened to me with the Cley Hill crop circle is that it was tied to many people I was currently working with. There are many more messages within this crop circle. This crop circle is indicative of what’s happening on the other side. There is a lot of negativity in the world that some people are seeing, and we need to instead focus on what’s really happening on other levels. The messages that are coming through in the July crop circles are that the extraterrestrials and extradimensionals are working with us now more than ever, and in particular, the Pleiadians, Arcurians, and Telosians. Many are working together as a team on the other side. Everything has shifted to another level and everything has grown bigger. My light star work is becoming a more powerful tool than the dark has. The crop circle image is representative of the new six pointed star light that I have created that will allow more to connect with the teams of beings that are working with us on a whole new level. However through guided meditation I can also achieve this with the light I am currently working with when we do our light journeys. The image of this crop circle needs to be seen by many. Metatron’s Cube is a two-dimensional geometric figure created from 13 equal circles with lines from the center of each circle extending out to the centers of the other 12 circles. Six circles are placed in a hexagonal pattern around a central circle, with six more extending out along the same radial lines. 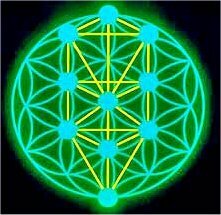 Metatron’s Cube shares 2-D resonance with the Flower of Life. It is a sacred geometry figure. Its name makes reference to Metatron, an angel mentioned in apocryphal texts including the Second Book of Enoch and the Book of the Palaces. These texts rank Metatron second only to YHVH in the hierarchy of spiritual beings. The derivation of Metatron’s cube from the tree of life, which the Talmud clearly states was excluded from human experience during the exile from Eden, has led some scholars (including Johann Andreas Eisenmenger) to portray Metatron as the means by which humanity was given knowledge of YHVH; presumably implying that study of Metatron’s cube would be necessary to understanding the tree of life. The pattern delineated by many of the lines can be created by orthographic projections of the first three Platonic solids. Specifically, the line pattern includes projections of a double tetrahedron (aka stellated octahedron), a cube within a cube (a three dimensional projection of a tesseract), and an octahedron. Although the image below shows the dodecahedron and the icosahedron fitting the pattern of Metatron’s Cube, the vertices of those shapes do not coincide with the centers of the 13 circles. The Flower of Life has thirteen circles. If each circle’s center is considered a “node”, and each node is connected to each other node with a single line, a total of seventy-eight lines are created. Within this cube, many other shapes can be found, including two-dimensionally flattened versions of the five platonic solids. In early Kabbalist scriptures, Metatron supposedly forms the cube from his soul. This Cube can later be seen in Christian art, where it appears on his chest or floating behind him. Metatron’s cube is also considered a holy glyph, and was often drawn around an object or person to ward off demons and satanic powers. There is a message within this crop circle that we are moving at light speed in ridding the planet of the dark forces! Metatron’s cube also has the Kabbalah Tree of life within it. On July 15, 2017, Michael Lee Hill was a speaker at my Cosmic Awakening Show LIVE Detroit Event. Michael gave me the disc that I have pointed to with the arrow in the above picture. As you can see, it is very similar to the six-pointed star crop circle of Cley Hill. The night before Richard Yiap called me, I had a thought to place my disc on my “favorite things” table so that I could see it. When talking with Richard on the phone about the crop circle and how it needs to be seen, I found myself focused in on it and realized the synchronicity. However, this crop circle is not just a Metatron’s cube. It has the added “8’s” or “s’s” depending on how you look at it. 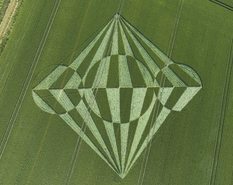 I found some interesting information on the Crop Circle Connector website about this. “According to the Mayan calendar, 18 July 2017 is a day of the Blue Spectral Storm Year (26 July 2016 – 24 July 2017) and on 26 July 2017 begins the Year of the Yellow Crystal Seed with Tone 12 – the Crystal Tone of Cooperation. The whole formation looks like a flower, symbolizing the energy YELLOW SEED – the energy of Flowering. The 12 circles “S” on the periphery depict “seeds” and symbolize the New Year of the Yellow Seed with Tone 12. The figure in the center depicts Merkaba. During the current Year of the Blue Spectral Storm we have received the Blue energy of Transformation, which transforms our cells in crystalline ones and helps us to build our Crystal Light body Merkaba. The Yellow Crystal Seed Year begins on 26 July 2017 and according to the Tzolkin calendar this is a day of the White Castle, which began on 15 July 2017. So the Yellow Seed Year caries also the energies of the White Castle, in which we purify ourselves and learn to build Bridges to each other, to live in Unity. Each of the 6 petals of the Flower on the periphery of the formation depicts a Bridge (B). Besides, each of the 12 “Seeds” S consists of 2 arcs, which also depict Bridges. Each “Seed” has one dark and one bright arc, and it’s core consists of one bright and one dark half. On this way is depicted the process of Purifying, which is typical for the White Castle. One of our main tasks in the Yellow Crystal Seed Year will be to purify our “dark” (negative) sides – in physical and spiritual aspect, on personal and on social plane. I don’t claim to understand all of Maya’s message above, but there are a lot of great key words that I can surely relate to. On July 24, 2017 I had a Skype session reading with Sean Bond from Silvercordss.com, who does Akashic record readings and healings. We were catching up on many topics and I asked him about the Cley Hill crop circle. Here is what he had to say. “It’s from a group from the future. It changes the timelines dramatically. It’s making the timeline awakening points go way faster. There’s like a war in making the dreamtime events for each individual on this planet be extended outward or being made to happen sooner. So this cuts it by a predictive model based on multiple timelines at once by 60%. That’s a huge shift. It has a lot of Lyrans, Sirians, Pleiadians, inner earth groups, that are coming back from the future and setting up a base in inner earth and then making strategic types of missions that will influence the population based on awareness and to a connection they have in the future and seeing the timeline shift into that and connect into that. It gives upgrades and balance to anyone that sees it, and it has a mystery school (connection) because they use various symbols that connect it up to 12th dimensional energy and information. It’s telling us that we have gotten rid of tremendous amounts of anchors to negative timelines that were trying to shift us and delay us. It is also a “news report” for multidimensional beings to be able to tune into layers and layers of information behind it- to see what the groups have done, what they are currently doing, and what they will be doing. Sean Bond’s conversation confirms the messages of Richard Yiap that groups of ET’s and interdimensionals that are working together hard on the other side and in the Earth to help us shift. It gives me confirmation through synchronicity that I am on the right path with the projects I am now working with to create community, ground light, and connecting with the CITIES OF LIGHT, beginning with Sarasota. I asked many people to share their experiences and interpretations of the Cley Hill crop circle. Here is what they had to say. “I love crop circles they always get me thinking. I always first picture it as a 3D exploding structure. And the crop circle is just the “splice” of the molecule where the earth was within its appearance. Basically most crop circle I would believe to be perfectly grounded, like lightning. Thus if we ever caught the instant of it happening it would look like a hemisphere coming out of the earth. If that makes sense. So I always try to grab all of the dimensions I can get from what it would look like in a sphere. Lol most dimensions I can get to is 12 but it could be just my imagination at times. It’s hard for me to imagine actual straight lines so when I see straight lines I always conclude there is more involved, ie. more surface or more structure on a compound angle that is not seen from that perspective. But yeah great crop circle! 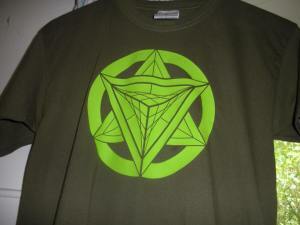 Crop circles + merkaba! Win win.” ~ Joey J.